Online resource to prepare SAT test! Millions of high school students take part in SAT tests every year. Some of them start to prepare the exam from 11th grade or even 10th grade, because SAT score plays an important role in college admission. For students who are planning to top universities, SAT test offers a fair scale to assess their academic skills nationwide. High school report cards and reference letters are indeed critical to apply for top universities. However, how do the universities select future students from separate school districts, states, and countries? SAT or ACT, the independent academic exam acts like a ruler to help schools decide whether a student matches its academic criteria. In general, all colleges and universities need applicants to provide SAT or ACT score. If you are planning to apply for top universities, prepare SAT tests as early as possible. Although SAT includes subject tests, and the general SAT has Math section, in nature SAT is an English skill exam. Its core, general SAT, focuses on reading and writing tests. So, English level is the foundation to get a high score. Only if a test taker has strong English capability, he or she has chance to challenge top score. This is why lots of students' the main job to prepare SAT test is to enhance their English language. English actually is the principle subject in high school. Enrich it means various jobs, from practicing grammar to building vocabulary. Here we specially emphasize SAT vocabulary because it is the base of other language skills. Either reading or writing would fail by a weak vocabulary. On the other side, build vocabulary is usually the toughest task and costs the most time in all tasks. SAT vocabulary is one of controversial topics in high school education. SAT organizer claims the test wouldn't emphasize on size of student's vocabulary, but all we know that vocabulary skill is the base of language skill. SAT doesn't test difficult words exclusively. It's true, but never means vocabulary isn't important in SAT test any more. Of course, the content and size of SAT vocabulary are changing in recent years. New SAT words are easier to master by common students. Build SAT vocabulary isn't easy, and it's even a hard job of more than one year if you target an excellent score. As all English exams, vocabulary level will definitely impact the final score. Thus, many students have to spend much time to learn and review SAT words. How to do the job efficiently is usually a hot topic among SAT test takers. We set up this website and bring new IT tools to let preparing SAT test easier and faster. This website concentrates on SAT vocabulary preparation. For students who are preparing SAT exam, especially in vocabulary building, it is right place. We understand students are different in levels and purposes. Some are going to apply for top universities; some only need basic score for local college admission. So we do our best to collect diverse resources for test takers, including popular SAT word lists, apps, experiences, e-books, and other materials. We hope SAT test takers can get useful stuffs from this web site. Many SAT vocabulary builders used to work with word lists. Because of the diversity of use cases, original levels, and score expectations, they need different word list. This we collect 8 word lists there to help test takers prepare SAT test vocabulary. The bully was initially truculent but eventually stopped picking fights at the least provocation. A visitor may be denied admittance to this country if she has been guilty of moral turpitude. That Christmas "The Little Drummer Boy" seemed ubiquitous; we heard the tune everywhere. The revolution ended when the victorious rebel general succeeded in his attempt to usurp the throne. Her narrow face was fixed in petulant defiance. We need more men of culture and enlightenment; we needn't any philistine among us. The enemy planned to pillage the quiet village and leave it in ruins. The challenge for church people today is how to be pious in the best sense, that is, to be devout without becoming hypocritical. Web apps are easy to access anytime and anywhere. 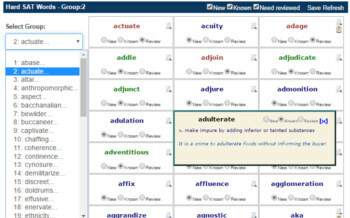 Some SAT vocabulary builders used to learn and review English words by software. Web apps are one of their favorites. We collected some SAT vocabulary related apps; they are excellent online vocabulary building tools, designed to speed up SAT test preparation, and proven by tens of thousands of users. 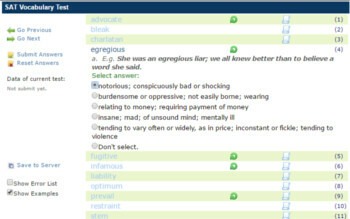 It's an online SAT word test by random to check if test taker's vocabulary level is met with SAT criteria. It provides a flexible and game-style practice mode in Internet environment, and is also an excellent quiz tool to evaluate vocabulary progress. For students who are trying to apply for top universities, they also need top SAT scores to support their application materials. They usually learn more difficult SAT words than common test takers. This app is designed for these students to accumulate hard SAT words in fast and convenient way. As a matter of fact the differences of SAT vocabulary skill among individual students are huge. Various SAT vocabularies can cover the requirements of some students; however others still hope to leverage more flexible tool to fit with their personalized vocabulary building. 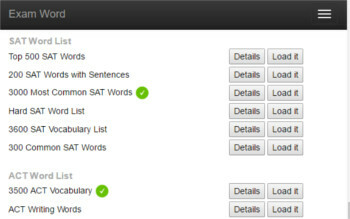 VOS (Vocabulary Study Online) can load multiple word lists, including customized lists and 6 SAT vocabularies in this website. With smart algorithm, it manages your SAT words and schedules learn/review activities . It's a flexible and efficient online English vocabulary app. 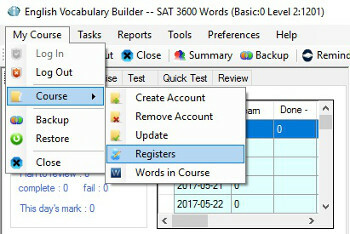 English Vocabulary Builder is a Windows app for SAT test takers. It has a near 4000 words list with definitions and examples. Students can schedule own paces and manage own plan. They can adjust course content, such as adding new words, updating existing definitions, examples, and notes. The tool can feedback accurate reports to improve study efficiency. It's a proven helper to speed up vocabulary building, the hardest job in SAT preparing. Although the website focuses on SAT vocabularies, we know SAT test takers concern all opinions and ideas that may help SAT exam preparation in easier and faster. Here we collect some useful articles, including tips, experiences, and training materials. Their topics are mainly vocabulary and how to build vocabulary, but a few are also involved with other matters that we believe SAT test takers are interested. Spelling is extremely important in SAT writing test. Interactive practice and test are effective way to improve spelling skill. All SAT vocabularies of this website provide each word an online spelling card. Namely based on various SAT word lists lots of interactive spelling exercises are available to try. It offers an excellent resource to prepare and practice SAT writing words. Flashcard is a common tool for students to memorize something. SAT vocabulary flashcard is similarly. However it's usually a hard task to get a set of SAT word flashcard that fits for your circumstance because every student has own original vocabulary base and separate pursuit. This website offers resources to produce personalized SAT vocabulary flashcards. Online and interactive quiz, like single choice, is a good option to keep known or half-known words warm. All SAT word lists of the website have developed dynamic single choice quiz for each word. A quiz has 4 definitions as options to choose; it is made by random and isn't repeated. You may go to any word list and select group, trigger it with just a click. PDF is easy to read and print. SAT Vocabulary PDF is a common format to learn and review words. In addition, some people prefer to have own PDF file of SAT word lists for various reasons. If you want one but don't have yet, you are in right place. This article tells you how to do it. Don't miss this free and convenient method to make and download own SAT PDF file. Most of students know SAT very well. In case you don't understand this exam and want to have a big picture, we include a brief to introduce SAT exam HERE.